This past weekend opened the new exhibition at the Pinacoteca in San Gimignano entitled “PINTORICCHIO – The Altarpiece of The Assumption of the Virgin of San Gimignano and the Sienese Years“. The show is dedicated to the famous painter Bernardino di Betto Betti from Perugia, better known with his nickname Pinturicchio (often also spelled Pintoricchio). The exhibition has been set up inside the Pinacoteca of San Gimignano, in the Palazzo Comunale (Town Hall). 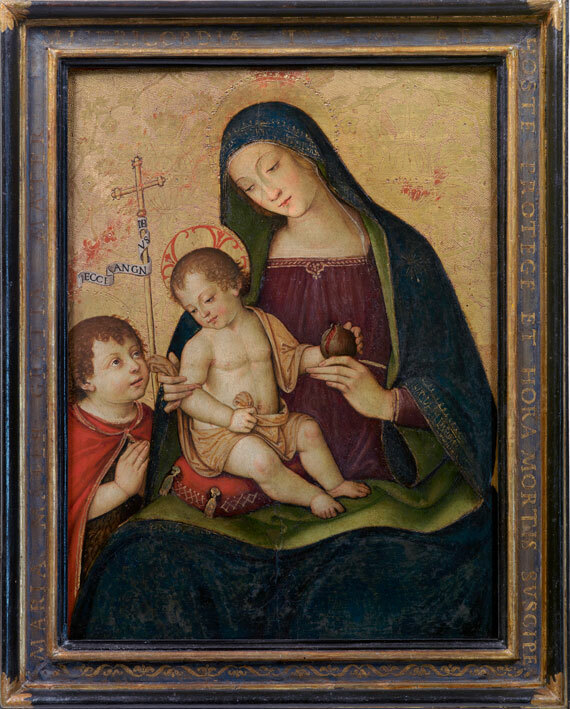 The main protagonist is the beautiful “Altarpiece of the Assumption” by Pintoricchio, a work created by the artist between October 1510 and February 1512 for the monastery of the Olivetian Congregation of Santa Maria Assunta in Barbian and which is part of the artistic heritage of the Civic Museums of San Gimignano. The Altarpiece represents the Virgin Mary in glory painted by Pintoricchio at the center of an almond. 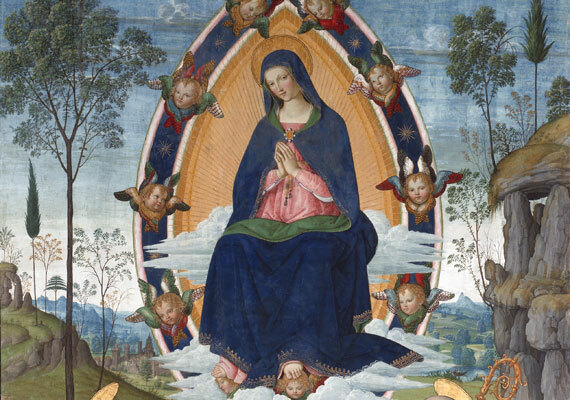 The Madonna is surrounded by angels and rests her feet on two cherubs. 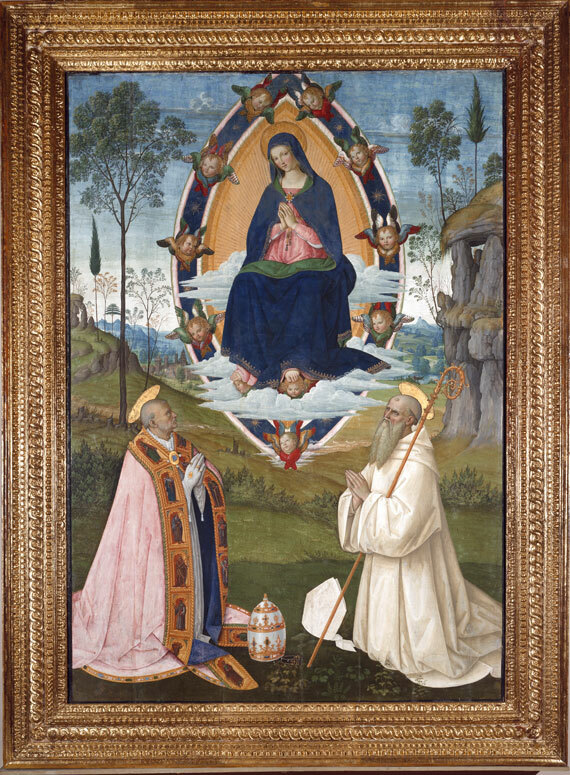 The city is represented in the background, while beside the Virgin are represented the Saints Gregory the Great and Benedict in prayer and looking to the Madonna. The Altarpiece of the Assumption is one of the last works attributed to Pinturicchio and this exhibition put together this masterpiece with several others by the great artist found in the Sienese territory, including the Madonna and Child with St. John the Baptist, the Holy Family and Saint John the Baptist and the Madonna of the Pomegranate (Madonna del Melograno), all from the National Gallery of Siena. Pintoricchio was a major figure on the art scene in Siena in the 1500s, as you’ll be able to explore this interesting exhibition which brings some of his work together. Among his beautiful masterpieces which cannot be moved, are the stupendously frescoed Piccolomini Library in Siena and the frescoes within the Chapel of St. John the Baptist inside the Siena Duomo. The exhibition “PINTORICCHIO – The Altarpiece of The Assumption of the Virgin of San Gimignano and the Sienese Years” will be open until January 6, 2015 at the Pinacoteca of San Gimignano, located on the second floor of the Town Hall which is part of the Civic Museums of San Gimignano. The museums of San Gimignano can be visited with a single ticket (valid for 2 days) that allows you to see the Civic Museum, climb all the way up the Torre Grossa to enjoy a spectacular view of San Gimignano, the Pinacoteca or Art Gallery where the exhibition is taking place, the Archaeological Museum, the Pharmacy of Santa Fina and Gallery of Modern and Contemporary Art “Raffaele de Grada “. While the exhibition is running, the cost of the full ticket is € 7.50, reduced ticket is € 6.50.